A sac which is formed at the lower end of thoracic duct collects the lymphatic fluid from the intestine and also two lymphatic lumber trunks flows from it. It is present in most mammals. The fatty chyle from the intestine is collected into this sac and then it appears as a new connection for the lipid products to digest. This conduit is considered the most common conduit for the drainage of lymphatic system. Cisterna chyli is known as the retro peritoneal structure. The location of cisterna chyle is right behind the abdomen near intestine and at the 1st and 2nd lumbar vertebrae. The cisterna chyle may get blocked and do not allow the lymph to pass on causes inflammation and pain in the lower abdominal area. Any injury and trauma external or internal may occur leading to the leakage of lymph in to the thoracic cavity near cisterna chyli and as a result the patient feel pain in the pelvic region along with pain in all body where ever the lymphatic system is distributed. It is a sac like structure which is present at the lower end of thoracic trunk and its main function is to collect lymph (a clear watery fluid present in the tissues of body) for a limited period of time. It traverses the lymph upward in the body. There are two reservoirs in body for the collection of lymph and other body fluids and cisterna chyli is one of them. 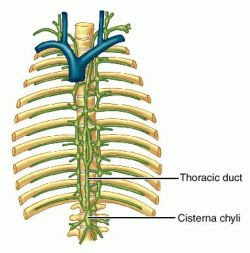 The cisterna chyli also controls the flow of lymph in the lumber region of body because two lymphatic trunks of lumber region are extended from cisterna chyli. The cisterna chyli may get swollen due to many reasons behind it and can cause severe pain in the lower abdominal area of the body. The swelling may occur due to any infection at the site of cisterna chyli most of the time due to accumulation of excessive lymph. The cisterna chyli also get swollen as a result of internal trauma or injury. Due to leakage of lymph from cisterna chyli may also cause edema leading to the swelling at the lower abdominal site of body. The swollen cisterna chyli may appear as swollen abdomen in the diagnostic procedures. The main problem associated with the blockage of cisterna chyli is the leakage occurs which ultimately cause edema. The blockage causes disruption in the lymphatic flow. The blockage may be traumatic or neoplastic. Due to the blockage of cisterna chyli there may be many problems like it causes the accumulation of lymph and lead to edema formation, the lymphatic flow to the lumber region is disturbed. The leakage may occur leading to many problems like formation of lymphatic fistula, formation of chylous ascites and chylothorax. These lymphatic disorders may lead to the life threatening condition of patient if become severe.